The outcrop of Oligocene carbonate succession is studied facially and sedimentologically which is about 60 m thick and located in the southeast of Drbandikhan town (northeast of Kalar town). This carbonate succession is exposed on all parts of the Sharwaldir Anticline which extend across the Iraq-Iran border in northwest-southeast trending as small domal anticline. Many facies and fossil skeletons are recorded that have environmental, stratigraphical and paleogeographical importance for understanding of the geology of the north-eastern Iraq. The main recorder facies are Foraminufera wackstone-packstone, bufflestone, algal- coral bindstone, bioclast wackstone–packstone and grainstone microfacies. These facies indicated that the lower, middle and upper parts of the section are deposited in fore-reef, reef-crest and reef- back reef environment respectively. The inferred formations are Anah and Baba formations for lower part and upper part respectively, while middle part is transitional Zone between the two parts. Chemical analysis showed that the succession is suitable for portland and white cement manufacturing in addition to easily quarrying. In Iraq, The Oligocene strata (Kirkuk Group) are now important oil producing succession in the area around the Kirkuk city in the Low Folded Zone of Buday and Jassim (1987).These succession consist of reef, back reef and fore reef carbonates or marls which are subdivided in to nine formations names as Anah, Azkand, Ibrahim, Bajawan, Baba, Tarjil, Shurau, Sheikh Alas, Palani formation (Bellen et al, 1959, Buday, 1980 and Jassim and Goff, 2006). 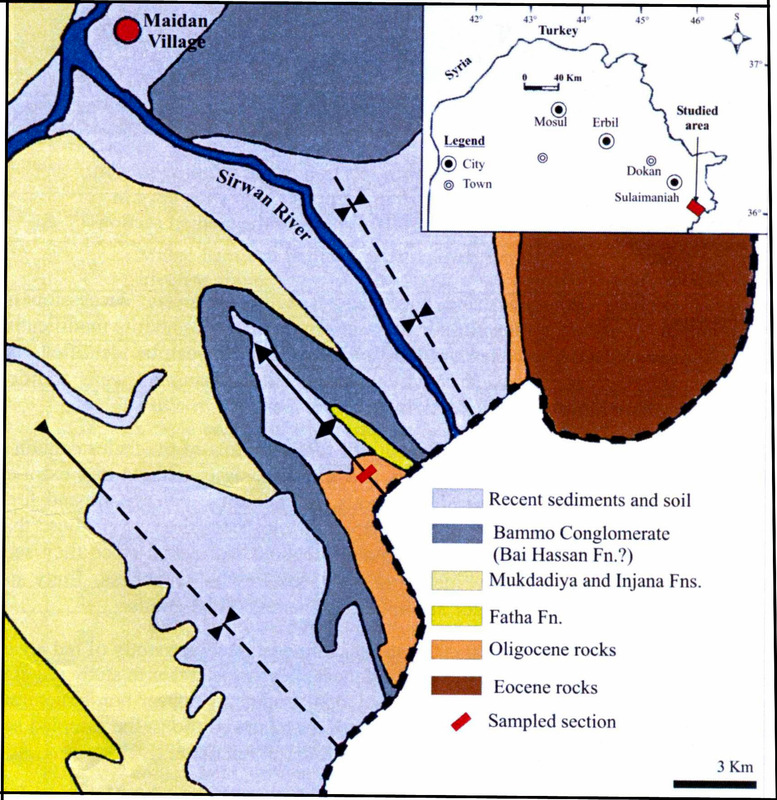 Youkhanna and Hradecky (1978) conducted regional geological survey for the area of north Khanaqeen in which the study area is located; including Sharwaldir anticline, they mapped different Oligocene formations in the area. Moreover, they reported about the paleontology and perology of the exposed rocks. Recently, Baba Shekh (2006) found two conglomerate beds and fossiliferous limestones in between in the Sangaw areas and he mentioned the probability of occurring of the Oligocene rocks in this latter area (about 40km to the west of the studied area). In the same area, Ameen (2009) referred to the presence of Oligocene rocks in different parts of Kurdistan, northeast Iraq, but not in the High Folded Zone areas. Later, Kharajiany (2009) studied the fossiliferous limestones and recognized Baba, Shekh Alas, Bajwan, Shurau and Anah formations along the both limbs of the Ashdagh anticline at the southeast of Sangaw town in the Low Folded Zone. Khanaqa et al, 2009, proved for the first time occurrence of Oligocene rocks inside the High Folded Zones. Ghafor (2004) studied biometric analysis of Oligocene in the Kirkuk area. The study aims study the facies of the Oligocene succession of the Sharwaldir anticline and its suitability for cement industry. The studied area is located about 35 kms to the north east of Kalar town about 30 kms to the southeast of Darbandikhan town (Fig.1); inside the Low Folded Zone. The main structure in the area is the Sharwaldir double plunging anticline in which the Oligocene rocks are exposed. The relief is about 850 meters high (above sea level). The southeastern plunge splits into two small anticlines which bend toward south southeast (Fig.1). Both plunge areas are disturbed by a normal fault. The studied section is located inside a small valley called Manga Bakal and the samples are taken across the right side of the valley directly to the south of the large and famous cave bearing same name of the valley (Fig.2). The GPS reading of latitude and longitude of the base of the section is 34o 49– 19.36= and 45o 41– 8.82= respectively and located 5 Km to the northeast of Hajilar village. In addition to sporadic and thick accumulation of recent alluvium sediments, numerous Paleogene and Neogene formations are exposed in the studied area but the main formations are of Oligocene age. These rocks consist mainly of milky (grey when weathered), hard and flinty limestone which shows slight fossil content and bioclasts in hand specimens. The lower boundary of the Oligocene succession is not exposed, while the upper boundary is with the Middle Fatha Formation, which comprises of poorly exposed 50m of alternation of green marl, detrital limestone and few beds of sandstone. A 100m thick boulder conglomerate (ex- Bamo conglomerate) of the Pleistocene age (Youkhanna and Hradecky, 1978) unconformably overlies the Fatha Formation (Fig.3). The study comprised field work to choose the best exposed section, collecting and field description description (with 10X hand lens) of 64 samples, which were thin-sectioned and studied under binocular microscope for faces and age evaluation. The percentage of constuents was estimated using carts given by Folk et al. (1970) and Tucker(1991). -Field study for finding the best section in the area. -Collecting 64 samples form a selected section and describing them in the field by aid of 10 X hand lens. 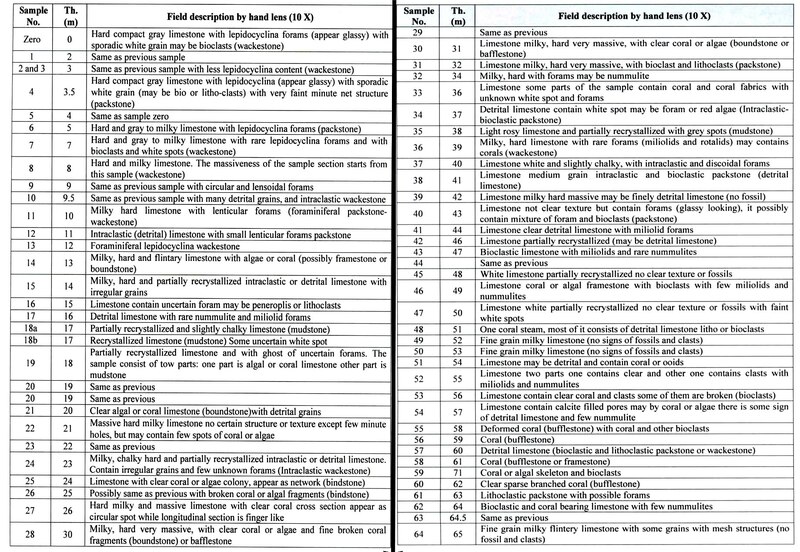 The description of the samples and the thickness (nearly equal to elevation above stream bed) are included in the table (1). – Thin sections are prepared for 64 collected samples, from the studied section. -The thin sections are studied under binocular and polarizer microscopes for differentiation of the constituents. – The percentage of constituents is estimated by using the charts prepared by Folk et al., (1970) and Tucker (1991). – Three samples are chemically analyzed for knowing the percentage of oxides for estimation of suitability of the limestone for Portland and white cement. (70m deep and 30m wide) in the Oligocene rocks. B) Detail of the studied section. The facies analysis (lithofacies and microfacies) of Oligocene succession in the Sharwaldir anticline is based on the classification of Dunham (1962) and its modification by Embry and Klovan (1971). The facies and most of their allochems can be identified visually in hand specimen (by eyes or hand lenses) however, all samples additionally investigated using both binocular and polarizer microscope. The studied section shows relatively high diversity of fossils. Most of the facies contain more than three types of allochems which are fossils skeleton, their bioclasts and rare lithoclasts without any extra-clasts. The main skeletal allochems are red algae, coral, echinoderm, pelecypod and foram. 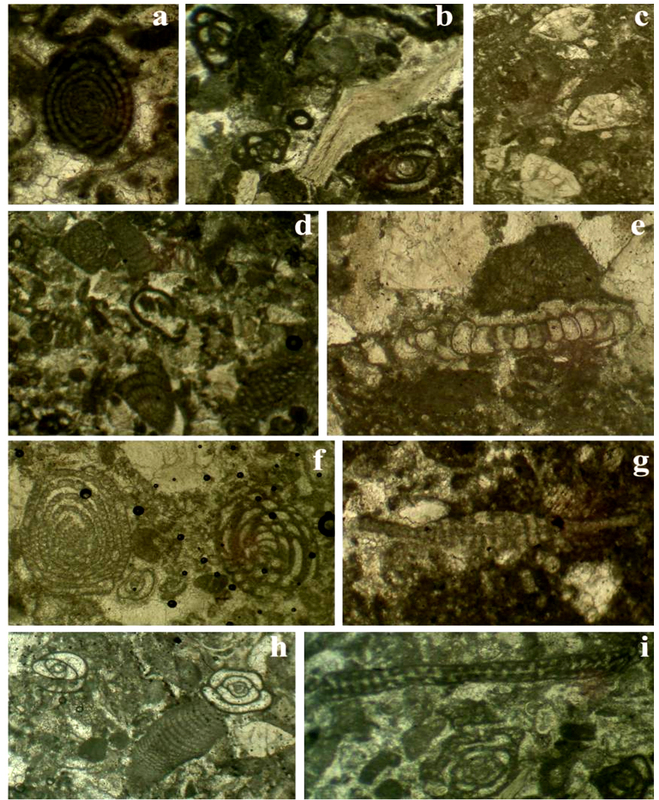 Among these fossils, red algae, which seems occur in most samples except those are comprised by coral skeletal grains (Fig.4), required detail discussion since they seem to influence the rock character greatly including such as toughness, flinty nature, sharpness of the edges, white or milky colour and apparent fineness of the grains. According to Flugel (2004), Tertiary limestones, composed predominantly of red algae, are important hydrocarbon reservoir in Libyia and Indonesia. He stressed that to study red algae in thin sections, needs high magnification, otherwise algal fragments appear non-structured and may be confused with micrite clasts. Such features were observed too in the sampled section as, in some case the thalli has structureless parts which similar to micrite (Fig.4). Another evidence for that inherited properties is that mentioned by (Halfar, and Mutti, 2005) that facies rapidly grown during early Late Oligocene and reached maximum abundance during end of Oligocene and Early Miocene (Fig.5). They added that during these ages’ red algae were commonly replaced coral-reef environments, accompanied by a decline in other carbonate-producing phototrophs. Bassi and Nebelsick, 2000, mentioned that Calcareous algae are important constituents of Tertiary shallow water in the Oligocene carbonates in the circum-Alpine region. The content of the red algae, in the aforementioned region, had often resulted in the designation of limestone as “Lithothamnienkalk”. The red algae exist either as encrusting (crustose) or erected forms (thalli). The former occurs as small multilayered body, few millimeters to few centimeters thick. 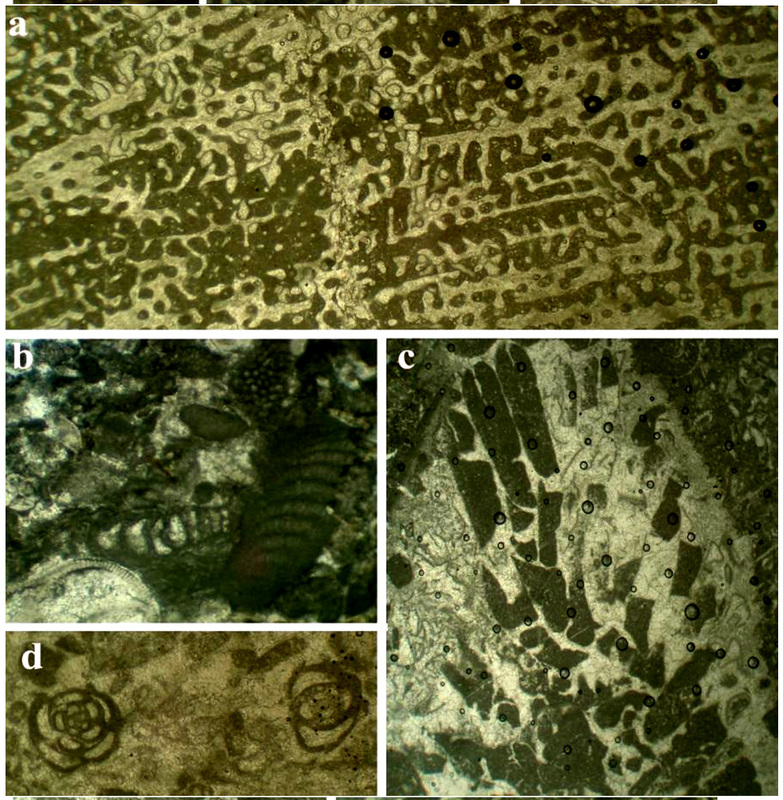 It consists of intergrown skeletal which appears in thin section as laminations and shows sediment-floored cavities that are roofed over by these laminations (Fig.4B). The Spaces between crusts are filled with wackestone or mudstone. The later is erected and non-encrusting form; consists of several joint and segmented thalli (Fig.6). Each segment consists of partitioned filaments (medulla) and peripheral cellular filaments (cortex) (Fig.6). Accordingly, it is assumed that the red algae have important role in composition and texture and ultimately the physical properties of the Oligocene rocks in Sharwaldir anticline. Fig.4: A) An erected red algae thalli in which the portioned filaments can be seen in the upper part, whereas in the lower part the texture is not similar to the upper part and it is similar to background, (Sample no.20, 12 X), B) Encrusting red algae that have the form of elongated nodule (Sample no.5, 7 X). C) Crustose (lower middle) and erected (left middle) algae (Sample no.46, 10 X). 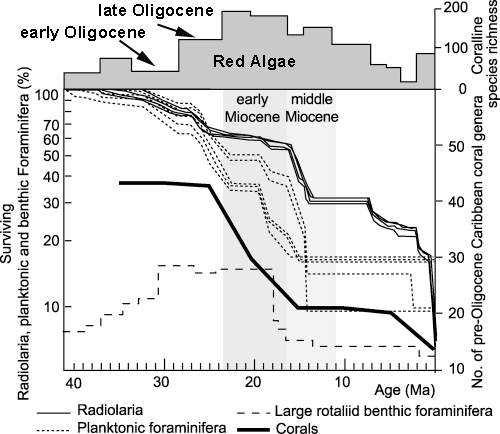 Fig.5: Rapidly increase abundance of red algae facies during early Late Oligocene, it’s maximum abundance was during Late Oligocene and Early Miocene (Halfar, and Mutti, 2005). This facies is common in the lower part and gradually disappear in the middle part and can be recognized either in the thin sections or by hand lens. The ratio of the grains is 15-70% and they are mud supported. 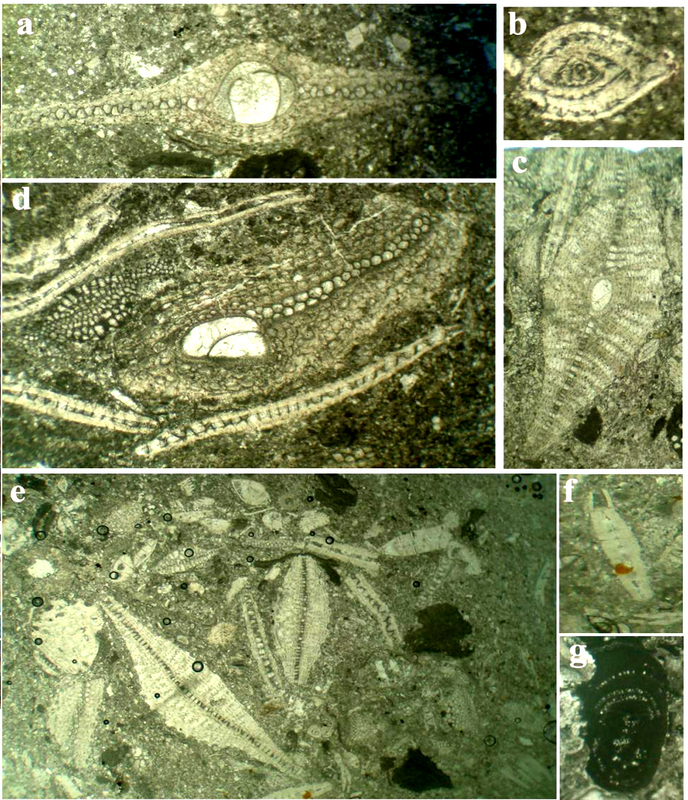 The allochems of this facies is consisting mainly of lepidocyclina and red algae (Fig.7g) with accessory nummulite (Fig.7b), echinoderm, pelecypod skeleton and their bioclasts. Toward middle part lepidocyclina totally disappear while both miliolids and nummulite and corals appear with increase the ratio of red algae. In rare cases nummulite packstone can be seen in one sample in the middle part. In many cases, this facies make up the spaces between the bindstone and bufflestone bodies. Along the whole section in all level and in the slides, forams can be seen. In two slides both nummulite and miliolids can be seen which unusual occurrence is as they belong to two different environments. But, the dwarf size of both indicate an environment that more or less tolerable for both. The bypass mixing by wave and current is not excluded. This facies consist of stalk-shaped and branching fossils that were trapped sediments during deposition by acting as baffles by slowing down water movement and allowing sediment to settle (Embry and Klovan, 1971). According to Flugel (2004) the feature for identifying the bafflestone is the presence of large number of in situ stalk-shaped fossils. This facies was discribed by Sadiq (2009) in the Aqra Formation (Maastrichtian) in the chwarta area which consisted of elongate rudist skeletons each about 5-10cm long and 2-3 cm in diameters. 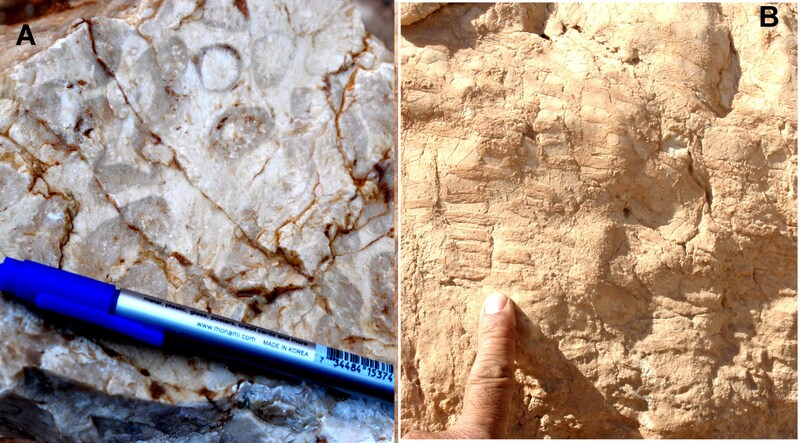 In Sharwardir section, bufflestone microfacies contain large and small branching roguse coral colonies, which can be seen in outcrops. The length of some branches is more than 20cm, as they found in the middle and upper part of the sampled section (Fig.8).The structure of the coral is mainly destroyed by crystallization; consequently, the fine texture is replaced by spary calcite. The spaces between the branches are mainly filled by micrite (mudstone or wackstone) with some bioclast. Walker and James (1992) have put this facies in the colonization stage of the reef structure. The presence of corals indicates normal marine salinity (Riding and Tomas, 2006). 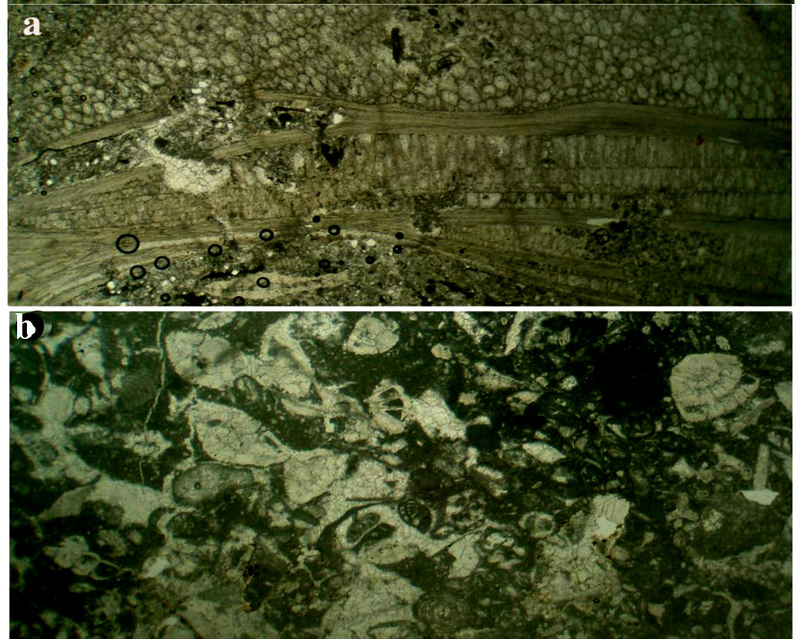 Bindstone or framestone is defined by Flugel (2004) as “occurrence of sessile benthic fossils that are densely spaced and preserved in life position. The morphology and distribution of the fossils should fit into an imaginary three dimensional organic framework. Organisms contributing to the formation of framestones have changed during Phanerozoic and include corals, coralline sponges, stromatoporoids, rudist bivalves and calcareous red algae”. Original components were bound together during deposition as shown by intergrown skeletal matter, lamination contrary to gravity, or sediment-floored cavities that are roofed over by organic or questionably organic matter and are too large to be interstices’’ (Dunham, 1962). According to Embry and Klovan (1971) the bindstone contain in situ tabular or lamellar fossils which encrusted and bound sediment during deposition and the matrix forms the supporting framework of the rock. In the Sharwaldir section, it consists predominantly of well-preserved or partially recrystallized red algae that are not affected by fragmentation. This facies include massive (non-branching) corals too which are, in some case, totally recrystallized (Fig. 9 and 10). The matrix consists of wackstone and contains bioclasts Green algae (dasycladales), gastropods, echinoid plates. The red algae bindstone is usually well preserved while those of corals are mostly recrystallized. Fig. 8: Coral (bufflestone) of the upper part of the succession, A) Fresh outcrops section, B) Oblique to longitudinal weathered outcrop sections. Grainstones are clast-supported and mud–free carbonate rocks and consist of skeletal and non-skeletal carbonate grains. The absence of mud has various causes such as deposition in high-energy environments (e.g.in intertidal and shallow subtidal environments), rapid accumulation of grains allowing no coeval mud sedimentation (e.g. tubidites, deposition in current-controlled environment, winnowing of mud from previously deposited grain/mud mixtures. 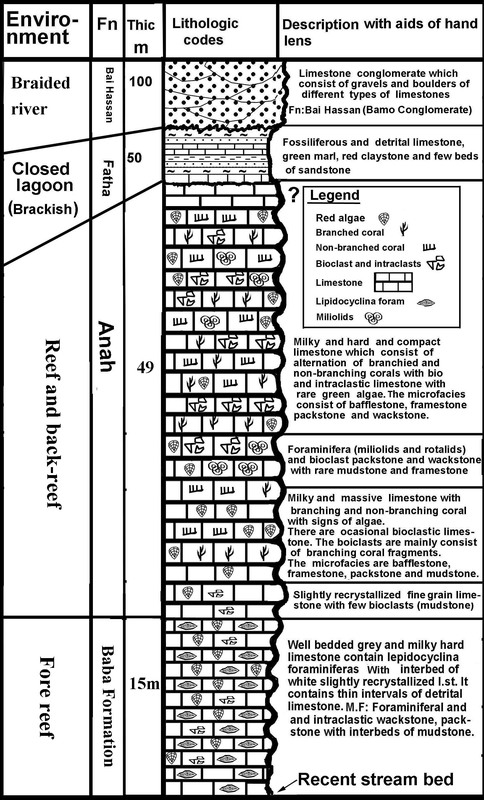 Grainstone are highly variable with regard to grain type, shape, size, and sorting (Flugel, 2004). Grainstones are common rocks in platform and ramp carbonates. They are usually related to the locus of wave energy absorption such as shorelines, shoals or shelf break where grainstones from thick accumulation at the outer shelf margins or in inner ramp setting. Bank-margin sands occur in tidal bar belts, tidal deltas, and marine sand belts, back-reef areas, on beaches and in subaerial dunes. Accumulation of grainstone can also originate below the wave sweep base owing to current effects (Tucker, 1991). The grainstones facies distinguished by grain supporting and the groundmass is consisting of spary calcite with the ratio of micrite less than %5 (Dunham, 1962). This facies is rare in the sampled section and appears in the middle part of the sections (in the sample no.38 table1) in which well sorted and rounded red algae peneroplis, miliolid and mollusk bioclasts are characteristic. In spite of roundness, the grains are more or less elongated in shape as appear from exited wackstone and packstone in other samples. The richness of the studied succession with red algae and other skeletons suggest shallow water level. The differentiation of the in situ red algae from their bioclaststs is difficult because the thalli is jointed into many branches and segments which could have easily separated as in situ or reworked bioclasts. In slides, the broken or differently arranged segment is indicated as bioclast (Fig.11, 12 and 13). Echinoderm plates and spines are common with red algae in addition to accessory bioclasts are pelecypods and forams. This facies occur in different levels in the middle and upper parts of the section and randomly alternate with bufflestone or boundstone. In literature, Yamano et al, 2001, found this facies behind the reef as unconsolidated bioclasts, such as coral fragments, coralline algae and molluscs. Fig. 10: A) Recrystallized coral bindstone under XP in which no sign of coral can be seen (Sample no.60, 15X) B) The same slide as can be seen by hand lens X3 which show ghost of coral. The Oligocene rocks are represented in the studied area by two formal units of neretic facies of Baba and Anah Formations. 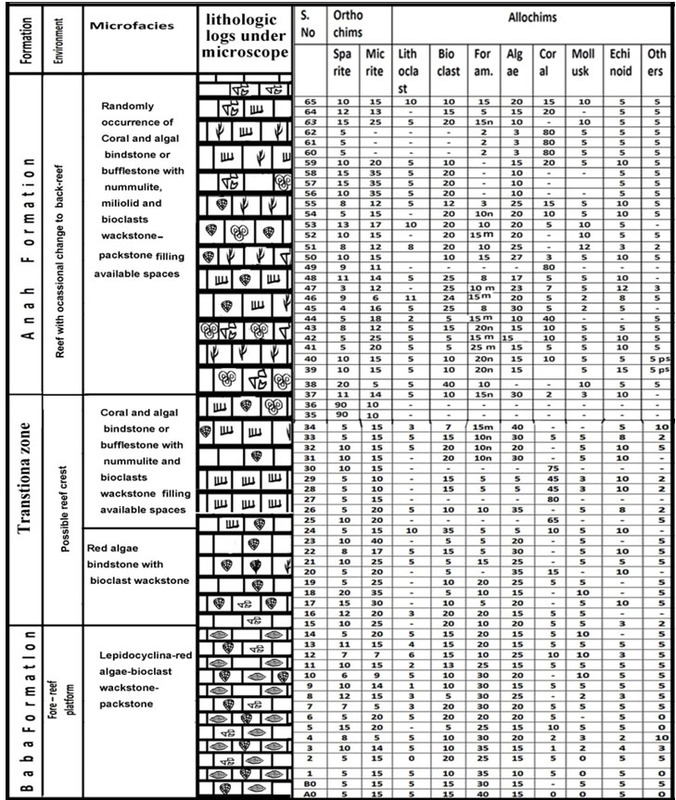 Microfacies orthochemical and allochemical numerical data and neretic foramimiferal assemblages are given in the fig. (14). Baba Formation represented by 16m of the lower part of the section; it’s base is not exposed. The exposed interval contains index benthonic larger foramimiferal group of Lepidocyclina (Eulepidina) elephantina, Lepidocyclina (Eulepidina) dilatata (Michelotti), Nummulites vascus Joly & Lymerie, and Heterostegina praecursor Tan, Heterostegina involuta Silvestri. Association of these species with red algae and sparse nummulite characterizes Baba Formation. The environment of this formation is fore-reef to reefal of Middle Oligocene age. Anah Formation represented by the top50m of the section and contains benthonic foramimiferal group : Borels pygmae HANZAWA, Austrotrilina howchini (SCLUMBERGER), Rotalia viennoti GREIG, and Lithophyllum sp. (Algae) Miogypsinoides dehertii VANDER VLERK, Peneroplis farsensis HENSON, Peneroplis sp. Lepidocyclina (Nephrolepidona) sp., Miliolid (Pyrgo sp. ), Lithophyllum sp. (Algae), Archais asmaricus SMOUT &EAMES and Austrotrilina howchini (SCLUMBERGER), Praerhapydionina delicata HENSON. This association with red algae characterizes Anah Formation. The environment of this formation is Back-reef to reefal of Late Oligocene age. 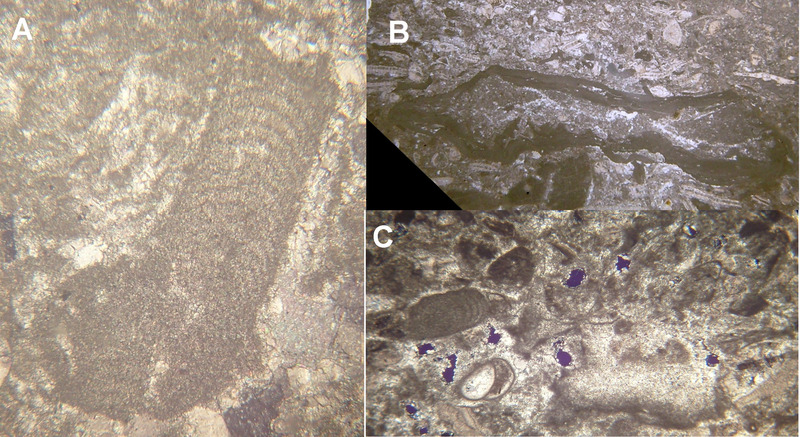 Fig.13: Sharwaldir section, Anah Formation, Late Oligocene, a) Boundstone with coral biolithite, (Sample no.27, 25X), b)bioclastic packstone/wackstone with Praerhapydionina delicata HENSON, Miogypsinoides sp. and Lithophyllum sp. (Algae) 50X. c) Boundstone with coral biolithite consists exclusively of Coral (Heliastra defrancei) (10X), d) Bioclastic packstone/wackstone with Austrotrilina howchini (SCLUMBERGER) (50X). 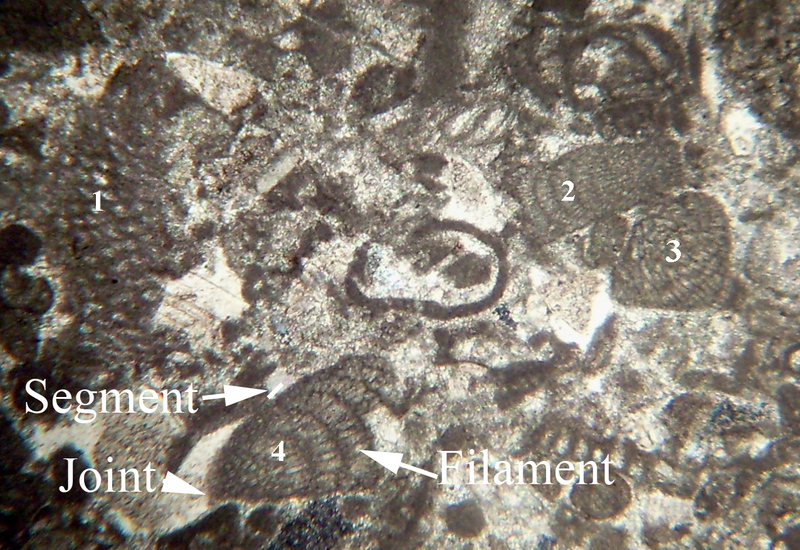 Fig.14: Microfacies and petrographic section of the studied succession, with petrographic components estimated under polarized microscope, using qualitative and visual evaluation. Three samples are collected from lower, middle and upper part of the section and chosen for chemically analysis (Table 2). The Oligocene carbonates of Sharwaldir Mountain indicate sutability for Portland and white cement manufacturing. The limestone constituents more than 90% of the bulk sample. The Percents of the CaO is more than %53 and MgO is less 2% (Table 2 and 3). Quarrying conditions are favorable in addition to accessibility through good paved road to the mountain. Large reserve can be estimated through site investigation. Is easy and paved road to the mountain is available and contain enough thickness that can be used for cement production. The chemical analyses are compared to the chemical constituents of raw material given by international standards such as British, German and Iraqi standards. Table (3) Mean value of chemical analysis of the three sample of the Sharwaldir Mountain, compared with standard composition of limestone of Portland and white cement in addition to Sarchinar and Tasluja cement factory. Barwary and Slaiwa,) 1993) geological map of Khanaqin quarangle, sheet NI-38–7) scale 1\250000) GEOSURV, Baghdad, Iraq. Bassi D. and Nebelsick, A J. H. 2000. Calcaerous algae from the Lower Oligocene Gornji Grad Beds of northern Slovenia. Rivista Itanliana di paleotologia stratigrafia, Vol.106, No.1, p.99.122. Bellen, R. C. Van, Dunnington, H. V. Wetzel, R. and Morton, D., 1959. Lexique Stratigraphique, Interntional. Asia, Iraq, Vol. 3c. 10a, 333 pp. Buday, T., 1980. Regional Geology of Iraq: Vol. 1, Stratigraphy: I.I.M Kassab and S.Z. Jassim (Eds) GEOSURV. Baghdad, Iraq, 445pp. Dunham, R. J., 1962, Classification of carbonate rocks according to depositional texture: in Northern Iraq. Arabian Gulf, Geology and Productivity. AAPG,Foreign Reprint Series, No. 2. Emery A.F and Klovan J. E., 1971. A late Devonian reef tract on north-eastern Banks Island ,N.W.T. : Bulletin of Canadian Petroleum Geology,Vol,19, P.730 -781. Folk, R.L., Andrews, P.B. y Lewis, D.W. 1970. Detrital sedimentary rock classification and nomenclature for use in New Zeland. New Zeland Journal of Geology and Geophysics, Vol.13, p. 937-968. Flugel, E., 2004. Microfacies analysis of Carbonate rocks, Springer Verlag, Berlin, 976 pp. Jassim, S.Z. and Goff, J. C. 2006. Geology of Iraq. Published by Dolin, Prague and Moravian Museun, Berno. 341pp. Ghafor, I,M, 2004, Biometic analysis of Lepidocyclina (Nephrolepidina) and miogypsinids of Baba and Azkand formations in Kirkuk area NE-Iraq. Unpublished PhD thesis, University of Sulaimani, 220pp. Halfar, J and Mutti, M, 2005. Global dominance of coralline red-algal facies: A response to Miocene oceanographic events. Geology, Vol.33; No. 6, p.481-484. Khanaqa, P. A., Karim, S. A. Sissakian,V. K. and Karim, K. H. 2009.Lithostratigraphic study of a Late Oligocene – Early Miocene succession, south of Sulaimaniyah, NE Iraq. Iraqi Bulletin of Geology and Mining ,Vol.5, No.2, P. 41− 57. Tucker, M. E., 1991 .Sedimentary Petrology. Blackwell Science Publication Co.260pp. Riding R. and Tomas, S., 2006. Early Cretaceous (Aptian) reef Carbonates in eastern Spain. Sedimentology Bull. Vol.53, Issue 1. Sadiq, D.M.2009. Facoes analysis of Aqra Formation in Chwarta-mawat area, from Kurdistan Region, NE-Iraq.Unpub.MSc thesis, University of Sulaimami,105pp. Yamano, H. Abe, O., Kitagawa H., Niu E., Nakamura, T, 2001. Coral reef evolution at the leeward side of Ishigaki Island, southwest Japan. Radiocarbon, Vol 43, No. 2B, 2001, p 899–908. Youkhana, R.Y. and Hradecky, P.1978. Report on regional mapping of Khanaqeen–Maidan area,GEOSURV, int.rep.no.903. Walker, R. G. and James, N. P., 1992. Facies Models Response to Sea Level Change. Geo Text, Geological Association of Canada , 454 pp.